The Dragon Electric Pump is available in 3 different types. 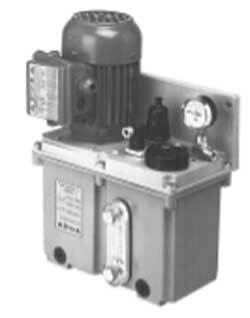 The 1st is a, gear pump which uses meter and control units. The 2nd is a gear pump which uses piston distributors. 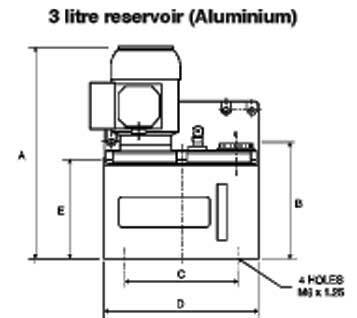 The 3rd is a gear pump which uses progressive valves. 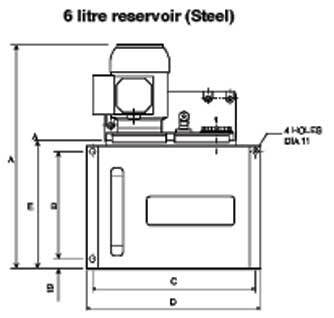 Motor Reservoir Capacity Delivery cc/min. Part No. Max Operating Pressure 70 Bar (1015psi) with 3-PH Motor 40 Bar (580psi) with 1-PH Motor 30 Bar (435psi) Continuous Svc. Standard Motor: 3-PH at 4P Multivoltage or 1-PH at specified. Special 3-PH w/ the following voltages: 220/380V - 240/415V - 255/440V - 50/60Hz 90Watts. 1-PH motor 220V - 50Hz 90Watts. 12V and 24V dc also available. 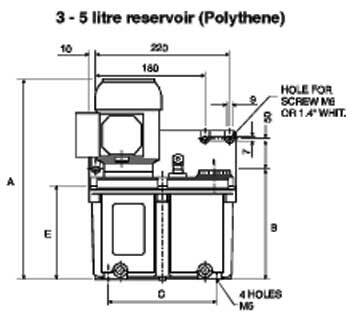 3-5 Liters (.79 - 1.32 Gallons) in Polythene semi-transparent. 3 Liters (.79 Gallons) in ALum. with level sight glass. 6 Liters (1.59 Gallons) in Steel with level sight glass . Low Level Switch Reversible float w/ contact normally closed on min level.